I really had no idea what to expect when I visited Splendid Cycles. You can’t tell much about a bike shop will be like from a website (assuming one exists), although you can get a sense of what they sell. And I liked what they were selling. Joel, one of the owners, seemed pretty nice when I emailed him (and turned out to be just as nice in person). Yet visiting the store made it clear how much I have been missing by relying on the internet to learn about cargo bikes. The average bike shop I have visited tries to have something for everyone, and that often means aiming directly at the market of people who are thinking about getting a bike for the first time. But it is fairly difficult to hit the price point that novices think is reasonable for a new bike (as I’ve mentioned before, based on talking to non-riders, of which there are many up the hill in my neighborhood, that price is: $100). But almost all bike shops seem to have a few bikes near the front door in the $300 range or so, not too overwhelming for the perennially broke college student, but a pretty stripped-down machine by any measure. The other day while chasing down my daughter in a bike shop I overheard a family discussing why two bikes that to their eyes looked identical were priced at $350 and $700 respectively. Like me several months ago, they had no idea. However cargo bikes are more expensive than other bikes. 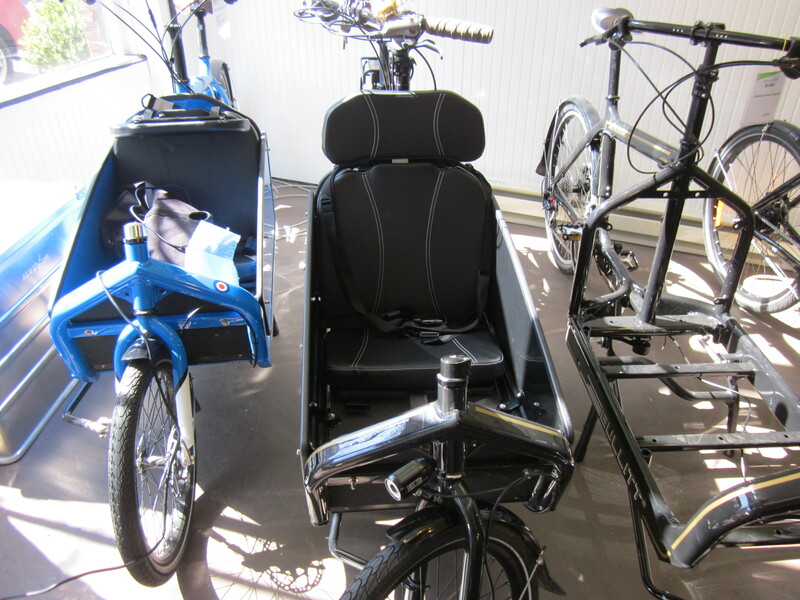 At their cheapest, new cargo bikes run about $1,000. The price difference reflects the fact that these bikes are capable of doing much more than carrying a student around campus. When you’re hauling real weight, on other places than the seat, everything has to be somewhat higher quality and differently designed, or you end up like my colleagues who tried to put child seats on their bikes and immediately broke all their spokes. And as cargo bikes become more capable, and as you add more accessories, like child seats and cargo bags, their prices rapidly rocket past that $1000 mark even for the least expensive models. Which brings me to Splendid Cycles, because it is the only bike shop I’ve ever seen that is exclusively selling bikes that replace family cars, but that still retain most of the advantages of ordinary bicycles. For our lives right now, visiting Splendid Cycles was a revelation. We don’t use our bikes just to noodle around the park on weekends (although that’s fun too), we use them to move ourselves and our stuff and our kids around town. I had always assumed that this required certain compromises: going more slowly, adding after-market accessories to make a Franken-bike, giving up going up and down hills, or being unable to get the bike inside if you live above ground floor. You can get a heavy Dutch bike if you live on the ground floor, in the flats, and don’t mind going slowly. Or you can cobble together family bikes from child seats and odds and ends like we’ve done and maneuver through traffic and actually make it up real hills, slowly, if you’re strong. Or you can go to Splendid Cycles and be blown away by seeing a dozen bikes that don’t require you to make those compromises. 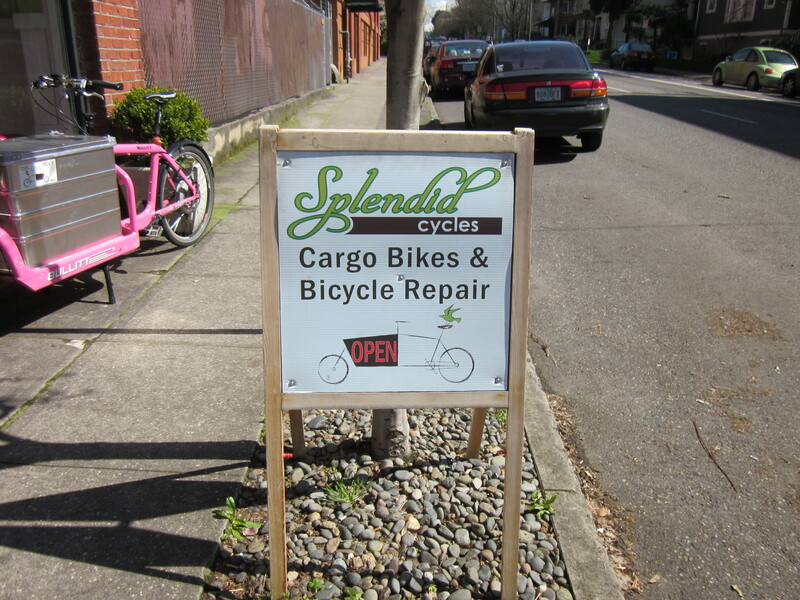 Splendid Cycles carries Metrofiets cargo bikes, which I had heard of but never seen in person before. As cool as they are, I realized immediately when I saw them that a Metrofiets would never fit through our narrow basement door. (Less than one minute in the shop and I’d already justified a trip across Portland.) The Winther Wallaroo looked even better for carrying kids, with outstanding seating, but had the same problem from my perspective: unlikely to make it into our basement. 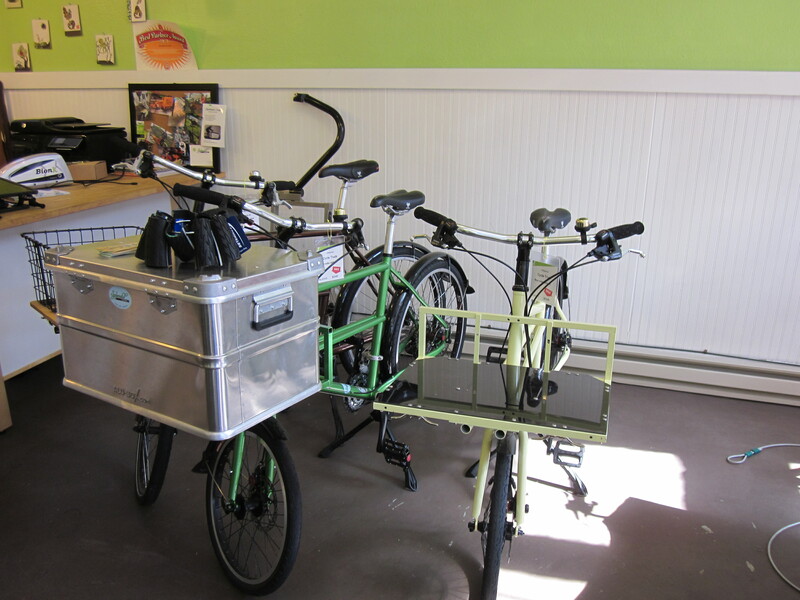 They carry Ahearne Cycle Trucks, which look pretty clever for carrying cargo but are not really designed to carry kids, so those aren’t our bikes either. They had a Big Dummy, which is designed to haul kids, among other things, and another one of which I used to carry my own kids across Seattle a week later. 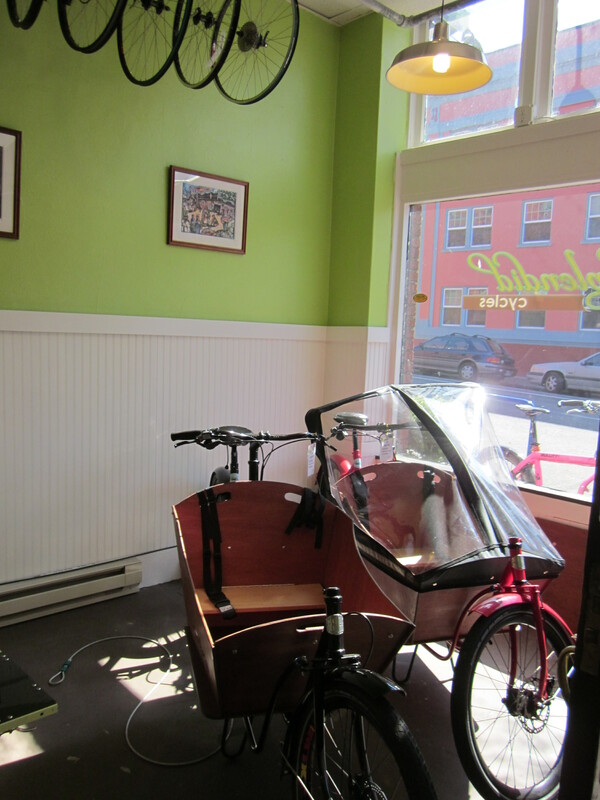 And rounding out the kid carriers, they had a bike I’d never seen before, the Bullitt. From the perspective of a city rider, this is probably the most interesting bike they sell. 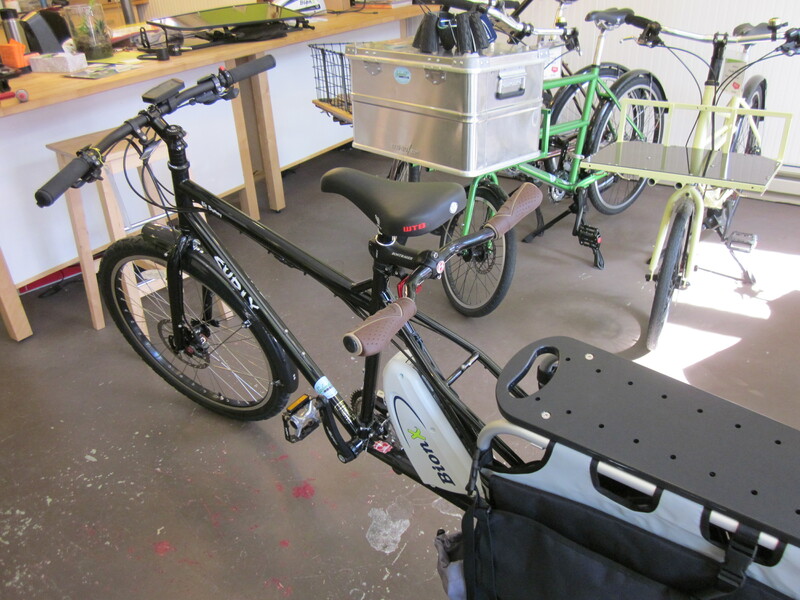 The Bullitt is narrow and lightweight; even with the child seat on it could probably be carried it up a flight of stairs. It can make it through traffic pinch points and climb hills. It is not perfect for our needs; the narrow child compartment probably limits its capacity to one of our (now older) kids. On the other hand, you could put a trailer-bike on the back (Joel’s great idea, not mine, he was full of them). It could be a great dad bike, but I can’t imagine riding it while pregnant; it does not have a step-through frame. But if you’re done having kids it would be something to consider. Walking into Splendid Cycles opened an incredible sense of possibility; there were so many bikes we’d never imagined that could do what we wanted them to do. Our kids would have loved this shop; getting them out of a Wallaroo, once spotted, would be almost impossible. And to top it off, at Splendid Cycles they know a lot about electric assists, which make these bikes reasonable options for people who live on hills. I didn’t understand the strengths and limitations of the BionX and whether it could handle San Francisco elevations when I walked into Splendid Cycles. Now I do, and yes it can. 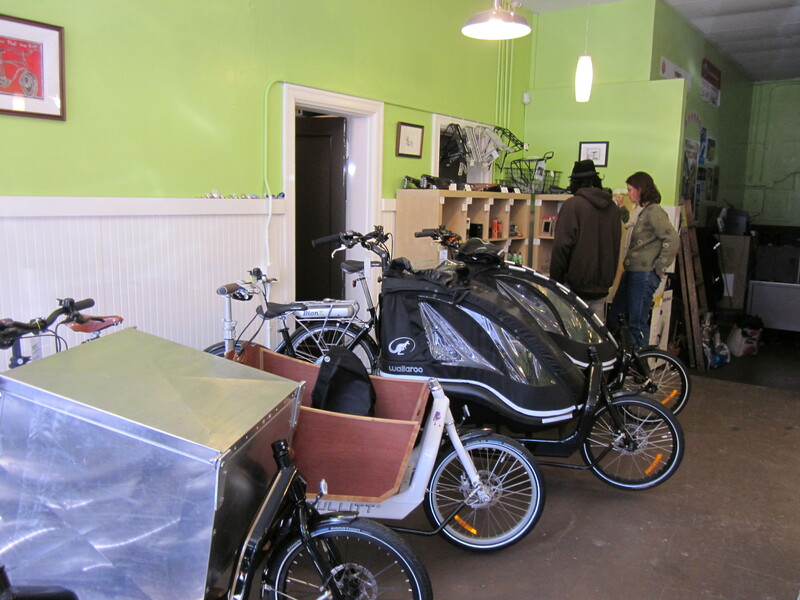 Overall I learned more about both cargo bikes and electric assists in person at Splendid Cycles than I’d learned in hours of reading reviews. It was amazing to be able to talk to Joel, who wasn’t figuring this out as he went along like we’ve been; he’d already thought about what was involved in riding with kids or cargo in traffic and on hills and had put together a half-dozen bikes, which were sitting right there, with electric assists, to solve our kinds of problems. This kind of expertise and fit for our needs comes at a price. And at one point that kind of price left me in shock, but I now realize that these bikes are worth it. They cost as much as the first car I drove, but that car was a junker, whereas these bikes are as reliable as bicycles can be. Furthermore, the bikes are more practical for moving around the city than that car. These are true car replacements, except we’d never have to worry about parking again. Thanks to Matt’s bike maintenance class, we’ve recently learned more about the compromises manufacturers have to make to get the price of cargo bikes down around $1,000 (crappy brakes, tires more likely to get flats, etc. ), and we’re now spending money to upgrade the MinUte to become more like the bike we want. So in many cases it’s a choice between paying up front for quality or paying later for repairs and upgrades. There are legitimate reasons to choose one or the other, but it wasn’t a choice we realized we were making at the time. 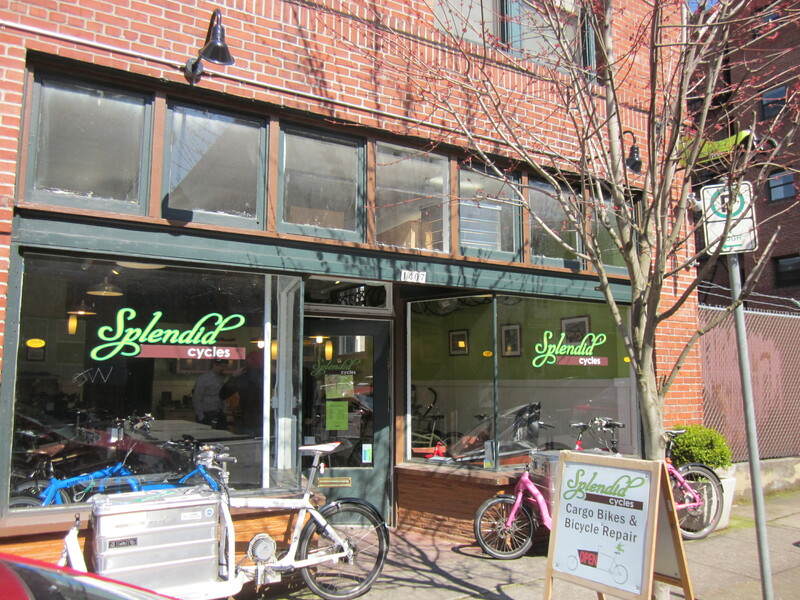 From my perspective, Splendid Cycles isn’t a Portland destination so much as a destination in its own right. It would justify a trip to Portland by itself for the right family. I met a father from Eugene visiting the shop who’d decided just that. It was definitely worth visiting given that I was already in Portland. Joel pointed out that Oregon has no sales tax, and that having Splendid Cycles ship a bike somewhere would cost less than the sales tax in less enlightened locales. I am an employee of the state of California and thus feel guilty for even mentioning such a thing, but for less tormented souls, this is yet another reason to talk to Splendid Cycles about cargo bikes. There are lots of reasons to be impressed by Portland’s bike culture, but its breadth still amazes me. I never imagined a bike shop like this could exist. Splendid Cycles has put all its chips on our kind of bicycles. It is a bet that the world will change to make space for many families like ours, and that one day hauling kids on bikes will be as unremarkable here in the US as it is in cities like Amsterdam and Copenhagen. I don’t think this will happen here while our kids are young enough to ride on our bikes, and I am envious that Portland can support a shop like this. I wish there was a Splendid Cycles in every city. me out loads. I’m hoping to contribute & aid other customers like its helped me. Good job.